Christine Delon – Page 2 – Did you know? It’s quite fun when two completely random books you’re reading happen to match up perfectly. I’ve slowly been reading Edward Tufts’ Envisioning Information. One of the infographics describes “The slow, costly death of Mrs K”. (I wouldn’t have thought it was an infographic as it is also a wall of text). The case is described in Clinical Bioethics, she lies in intensive care, being poked and prodded, so she can lie in comatose suffering for a month never recovering and so far as I can see, with no hope of recovering. None of those treatments prolonged her life meaningfully, or gave her a better death, however she might have defined that. And this is half of what Atul Gawande’s book, Being Mortal is all about (because the ‘some doctors questioning the practice’ in 1984 evidently didn’t have much influence. Hopefully writing a best selling book questioning the practice will have more luck). The first half is elderly care, equally fascinating, and very current for our aging populations. However it was the end of life care that I found most fascinating. Atul highlights the difference good end of life care can make comparing two cancer patients and also his own Dad who had cancer, and how important it is to ask the patient the difficult questions and make it clear if they are up against a rock and a hard place. Not a rock and a cure. He compares the two surgeons who advised his Dad on the rare spinal tumour that was squashing his spine and causing pain and paralysis. One surgeon advised instant action because he could be paralysed any minute and the surgery could cure him. The other surgeon pointed out that the surgery could equally maim or kill him and that these cancers usually grow quite slowly so he should hold out until the current pain and paralysis was intolerable enough that the risks of the surgery became more acceptable. And the tumour was slow growing and Dr Gawande had two or three years of good life and good work (very important to him) before the surgery. In hindsight the operation went well and he had some more years after that, but that could never have been guaranteed. Atul also told the story of two cancer patients, and how hospice care, provided in addition to normal cancer care, can actually prolong life (shown to be the case in the US). Part of the benefit was that the palliative care team could train the patient and their family in simple medical procedures so when the inevitable next step came along, they were prepared, knew what to do, had the medication to hand, and could cope. 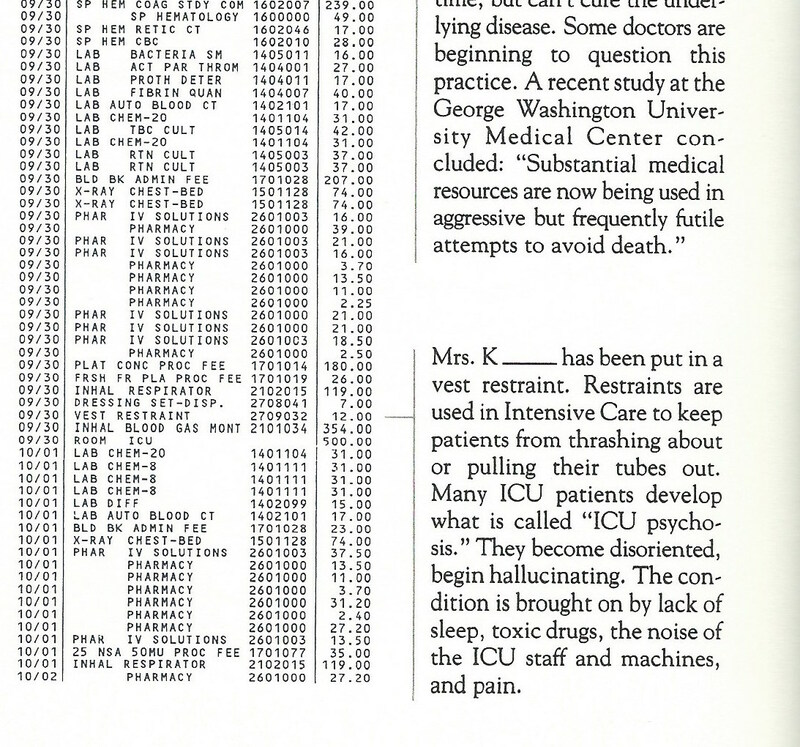 When the second patient became very breathless, without the hospice care they didn’t have oxygen at home, or the training in what to do, so they rushed into hospital where she was put her on as many machines as possible, leaving it to the family to decide when it was time to unplug her and denying her the the death at home she had wished for. Atul also describes two such home deaths, of his father and of a patient, where, by fully understanding her wishes, he had carried out a much smaller scale surgery than he might normally have done so she was well enough to go home. In order to fully understand the patients wishes you need to ask the right questions and Atul spelled out what he learnt (here it is in checklist form). “What is your understanding of the situation and it’s potential outcomes? What are your fears and what are your hopes? What are the trade-offs you are willing to make and not willing to make? Sitting here writing/reading a blog you can see that these are incredibly easy questions to write down/read out. Applying them in real life probably takes a bit more practice. Indeed Atul was inspired to make the effort after remembering some pretty gruesome ‘wrong’ decisions made by patients who might have mistakenly thought the huge surgery would ‘save’ them rather than ‘give them back bladder control for the last few weeks of life’. In Almodovar’s All about my Mother we see the Spanish doctors go through quite a lot of training on how to ask family to donate the organs of their loved ones. The people playing the family members think up lots of difficult, and racist, questions to train the doctors. These are also questions any family member can ask. One story concerned someone who, despite working in this field nearly couldn’t have this conversation with her own Dad. On the way home she realised her mistake and went back to ask him, ‘what is the most important thing for you now’. He replied that as long as he could watch sport on telly and eat ice-cream, life still had meaning for him. When he was in the middle of surgery and the doctor asked the daughter what they should do, she know what the criteria were. If it goes wrong will he still be able to watch telly and eat ice-cream … ? I’ve just read Mindless Eating and it’s pretty interesting, though I’m not sure if agree with all of the premise. The premise is we can stop getting fat by eating less and we can change our environment to make that happen without our noticing it and feeling deprived (obviously I agree with that part). In fact this is where Dan Ariely says free will comes in (Behavioural Economics Ate my Dog). We tend to rather blindly follow cues from our environment, and never notice the extremely powerful effect it has on us (countless food related experiments in Mindless eating) yet we can control our environment. And the good thing is, once you have done the upfront thinking, considering and planning to set up your environment, you can relax and mindlessly follow your new ‘rules’ (also the point in Willpower). Brian Wansink researches how much we eat in various set ups. They have experiments in labs (which look like living rooms) and fake restaurants, with hidden scales everywhere to weigh what you eat. I liked the one about portion sizes, where if you give someone 200 M&Ms in a bag they will eat an average of 73 in an hour but if you give them a bag with 10 bags of 20 M&Ms people will always finish a small bag, but they will eat less of them averaging 42 M&Ms. So if you want to buy in bulk you should always portion out helpings into smaller containers. So we might want ‘one’ of something (or three!) but the the size of that ‘one’ is quite flexible. I’ve found this myself with a tray bake birthday cake cut into squares which were further cut into triangles. I would have been perfectly happy to eat a square, but one triangle was one piece so I ate just one piece. Though the book has lots of good useful strategies to eat less without feeling you are eating less, in some ways I felt the book was at cross purposes to a healthy diet because it doesn’t use my strategy. It discusses how to snack less when watching telly, but it never considered whether, maybe, we should just not snack! (to be fair it does discuss how not to snack before dinner). Because not being able to stuff our faces with sweets at all times will make us feel deprived. In fact the people in the book are faced with such a barrage of snacks (all unhealthy) you really understand how difficult it is for people in the US to eat sensibly. This reminds me of Gretchen Rubins’ book Better than Before on how to foster good habits. One method is abstinence, avoiding something altotether, may be easier than moderation. And having ‘bright line’ rules for what you do and don’t eat can protect you even in this super-food-saturated environment. So rather than putting your snacks into small bags, you could having a rule of ‘no sweets’ or ‘only have sweets as an actual pudding after dinner’ or (my rule) ‘no snacks, except almonds or birthday cake (about once a fortnight), but also eat proper meals so you are not hungry. Faced with the absolute barrage of junk like the people in the book, I could feel how my rules would protect me and simplify my choices (just say no. I’m not saying it wouldn’t take a bit of willpower, if I was faced with the vast amounts of snacks, like the people in Mindless Eating I’d probably end up faffing more, but abstaining would protect me from the snacks). I wonder if the obsession with snacks is a US thing. In one case they said that when ‘European’ researchers joined the food lab they were surprised that they could do experiments at any time of day because people were willing to eat at any time, while those researchers were used, at home, to only do food experiments at breakfast, lunch and dinner. Alas that one can only eat three times a day. If one partakes of the 5 o’clock one doesn’t appreciate the dinner with the proper quality of expectant gastric juices. And the dinner, let us remember, is the supreme meal of the day. Funnily just as I was joking about the website from the IT crowd where you enter all your details and it gives you your deathday (3pm Thursday if you don’t eat your greens, also the motherless ovens is driven by Scarper Lee’s impending deathday), I’ve found out that we can all access the system the GPs use to calculate our risks of cancers or heart disease (caveat caveat, don’t use it without your doctor…). The GP one sits inside their system and can safely use your data on your GPs database. The one we can use just sits on the website and you have to enter you data yourself, but it’s a really simple one page checklist. On the symptoms checklist, out of 19 options, blood comes up 7 times depending on where it is. It’s as if random bleeding is a bad thing. The postcode is used to estimate your deprivation. It could be an idea to compare the numbers you get with the numbers your GP gets. If your numbers are lower perhaps the GP is missing some family history. Also, who would have thought that difficulty in swallowing is more of a risk factor than a family member with type 2 diabetes and a family member with breast cancer put together? Who even knew difficulty in swallowing was a thing? These three risk factors give you a sprinkling of frowny faces on the overview panel if you are 68, but not if you are younger. The moral of the storey is that staying young is the best way to avoid cancer, it’s also good for Hollywood careers, so really, we should all follow Orlando’s example (not Bloom). Though I was a bit dismissive of caveats above it’s interesting to note that though the system was built using (anonymised) data from 2.5 million people, it is still only sensitive enough to give meaningful risks for the ‘big 10’ cancers (the ones on the list when you click calculate) and it’s not good for rarer cancers (yet, adding more data will help). Also the tool is created with data from 25-80 year olds, so is only suitable for those age groups (I’m pretty sure bleeding randomly is bad whatever your age though! Get that checked out). My impression of how useful a tool like this is, is influenced by a tool to predict genetic causes of diabetes (e.g. MODY). While the overwhelming majority of diabetics are now Type IIs and Type Is are next (their pancreas has been knocked out, most likely by the immune response to a mystery virus), there is a small category of people whose diabetes is caused by a mutation, and if you can identify these patients, it may change the way they are treated. For example some people just have a tiny stunted pancreas. Giving these people drugs to squeeze out more insulin from the pancreas probably won’t work and they should probably go straight onto insulin. Some people have a permanently higher blood glucose, but the body works perfectly well to maintain that higher level. A bit as if your body thought your body temperature should be 38 degrees. It is crazy hard to bring these levels down, and luckily it seems to be unnecessary, these people seem to be at no greater risk of long term conditions. so these ‘diabetics’ need to not be treated. And best of all is the condition setting in before six months (before you have a functioning immune system that could kill your pancreas) where you have the blood glucose sensing system, you have the insulin producing system but they are not connected. They can be joined back together by massive doses of sulphonylureas (basically a pill) which will eliminate your need for testing your blood sugar and injecting insulin. Almost a ‘cure’ for this tiny minority of a tiny minority. The point about algorithms here is that Prof. Andrew Hattersly who has led the research into these conditions, who can safely be considered an expert on genetic causes of diabetes has tested himself against the algorithm he built and he found the algorithm can guess better than he can. So swing on over if you’re diabetic and have family member with diabetes and want to review yourself. So with this endorsment for one algorithm, I’m inclined to believe a different one can probably at least flag up useful pointers. This can further be tied to the outguessing machine described by Poundstone in Predicting the Unpredictable. The machine was built in a pre digital age (the ’50s) and by simply remembering whatever you guessed the last two times a given option came up (with a 16 bit memory), it could consistently outguess anyone. Because (from Thinking Fast and Slow) multiplying lots of small numbers in our head is not a major human skill, so leave it to the algorithms. Author christinedelonPosted on 4 November 2015 Categories books1 Comment on When is your deathday? ONS has taken their population predictions, allowed you enter your date of birth and gender and they can tell you how long you get to live. Pretty neat. Also much better than the one in Series Two from the IT crowd. Though that one took into account how many portions of veg you ate the ONS one gives you better numbers (more than a week). ONS is giving me 90 years, while my grandmother lived to 92. I thought this was part of my generation being the first to not live longer than the previous one due to our terrible obesity epidemic, but the odd thing is that I get a better life expectancy than my mother, and nearly double her odds of living to a 100. So wow. 90 years! I feel a bit like Artie in Narbonic. (Artie was originally a gerbil with a normal gerbil lifespan before Helen decided he could better carry out dashing rescues if he was bit bigger). ONS is mainly motivated by showing you how much you need to save up for your pension (and probably preparing us for the inevitable moving back of state pensionable ages). This was also a theme in Patrick Susskind’s Parfume. (I can’t remember if it made it into the film as a theme, and I think they skipped his childhood anyway). The theme was that everyone who had any long-term contact with the Grenouille (the protagonist) died a miserable death (but randomly, due to fate or magic realism. He did go round killing people, but that’s another theme). In his early years he was brought up quite neglected with not enough food or warm clothes (as I recall). This was because the woman who brought him up at a sort of private orphanage skimped on the children to save the money she was given for them for her old age, but she lived and lived and lived, so she did die in public hospital sharing a bed with someone else and was buried in a mass grave, her greatest fear. So, um, better start saving, but index funds only! 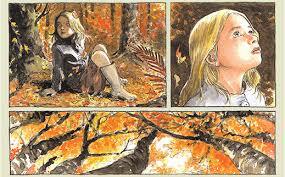 I recently read Beautiful Darkness, by Fabien Kehlmann & Kerascoët, translated from the French. The artist Kerascoët is really two people, Marie Pommepuy and Sebastien Cosset and the story is based on an idea by Marie Pommepuy. And what a great story. I must have read it 10 times in the last week (it’s not that long). Starting with a tete-a-tete over hot chocolate and cake, a disaster forces the heroine to escape through dank, creepy, slimy collapsing corridors to freedom in forest. Freedom from a little dead girl lying in the woods with hundreds of tiny people climbing out of her eyes and nose and mouth. This is some of the anti in the fairy tale. We never really learn what ‘before’ was like. But these little people are woefully unfit to live in a forest, victims of cats, birds and ants, they nevertheless try to make a world for themselves. The origins of these little people is never explained, you probably can’t think too hard about it. They had sofas and clothes and teapots, so they must have lived in some kind of psychic space inside the girl (called Aurora). They know what sunstroke is and at least one of them can read. It seems that most of them didn’t know each other until they all ended up in the forest together. The blurb says it’s a searing condemnation of our vast capacity for evil writ tiny. But the winnowing down of people is not just by each other, it’s mostly by the ginormous forest creatures. Even the plants are dangerous. One little creature (little girl? ), turns up with a itchy swollen hand, later her entire arm and half her face is swollen, next she is swollen all over, then we never see her again (so attention to detail and rereading it a few times pays off). Keep an eye out for the triplets/twins (I didn’t notice the twins used to be triplets on the first read), their conversion from triplets to twins is one of the more horrible scenes (in a good-story way). And there’s no evidence that anyone becomes evil once civilising influences are off, the impression was more that they were themselves (evil or good) all along, only now they are up against the wall (the forest, then winter). It’s interesting to read online reviews, Zainab suggests the four main characters can be seen as Auroras conscientiousness, psychoticism, neuroticism and openness to new experience. But the comic is more about questions than answers. What would that make all the other little people? (their-six year-old self? their enjoys-pulling-legs-off-insects self?). While it’s interesting to think about, they are not a straightforward representation as seen in Narbonic (definitely read that review as well, it’s really good, also do read Narbonic too). I’ll close with a picture of something that didn’t happen. We see Aurora waking up and going home. That’s what should have happened. We never find out why it didn’t. Build character, without doing something you hate. I was just reading Willpower by Baumeister and Tierney, which I enjoyed a lot. For some reason I had very good willpower while I was reading it. They take the idea that intelligence is supposed to be a good thing in life, but that actually ‘resisting the marshmallow’ or willpower also has a really strong correlation with ‘success’ (listed in the link). And that willpower is much more amenable to practise. “On the whole, tho’ I never arrived at the Perfection I had been so ambitious of obtaining, but fell far short of it, yet as I was, by the Endeavor, a better and a happier Man than I otherwise should have been if I had not attempted it”. The funny thing is that the recommendations end up really supporting religion. Lots of religious practices, meditating every day, praying every day, praying five time a day all add up to practising willpower. It seems that anything you do because it’s the right thing to do, whether or not you feel like it, is practising willpower. Or you could say that because you don’t feel like it you build character And the work done here gives you strength to do more good things in a virtuous circle. They also mention that the more tidy our environment, the more self control we have. In the study they quote you can be offered some money now, or more money in a week. People in tidier surroundings are more likely to choose to wait a week. This is funny as Gretchen Rubin studied the effect of clutter on happiness, pointing out that clutter is all over the popular press (blogs) but is not studied much, yet keeping clutter under control is an essential, foundation, habit so around 2011 the science caught up. It might seem really obvious but I’ve also realised that reading about something, helps you think more focusedly on that subject. So while I was reading stuffocation, I decluttered (even thought the book is only partly about that) and while I was reading Willpower, I was keeping better habits. This suggests that constantly reading different books on the same subject can be useful at practising that subject, even if the books are not adding any new information. Even though I’ve decluttered reasonably well (though not as well as if Marie Kendo really came round to my house to say are you sure that brings joy to your life), it seems that reading a decluttering book every quarter would be a good way to inspire you to keep on top of things. Finally an excuse to get more of these books. The final sentence is to point out (despite the Calvin and Hobbes strip) that I don’t think it is at all necessary to do pointless tasks to build willpower. In life and in the world, there are enough useful tasks that need doing, and helpful habits that can be built up, there is no need to build character just for building characters sake. Build character by building a habit of something useful and worthwhile (writing blogs?). Author christinedelonPosted on 22 September 2015 Categories books, UncategorizedLeave a comment on Build character, without doing something you hate. Why do I feel like London is built by the renters for the investors? The title is inspired by my feelings when walking through the new bits of Kings Cross between York Way and Caledonian road. Glossy but anodyne buildings renovated at a high cost by investors to rent at a high price, which results in £7 beers (those high rents aren’t magiced out of nowhere). In a perfect world the area would have been built up by the business owner, making profits out of the turnover of the busines and investing it in better buildings. (I don’t know if that’s what happened, that’s just how it looks). This is something I thought of after going to the London Fairness Commission event, Is London a Fair City at Guildhall this evening. The debate is ultimately derived from the ideas in the book The Spirit Level, Why More Equal Societies Almost Always Do Better. There were a number of interesting ideas. The London Bridge Trust maintains five bridges but has so much money they have widened their charitable remit (but they still maintain the bridges). Even though housing was supposed to be the third item it kept bleeding through to earlier items. Inequality has gotten better since 1915, so we should stop making a fuss. Even though it got better because of changes after the wars that have been going backwards. If rich people pay more tax we should consider that job done, and not worry about why they have so much money to pay more tax with. It would also help if you clarify whether they pay more in absolute numbers (yes) or a percentage of their income (not so much) This ties into an idea that wasn’t discussed. Everyone was very keen on a proper living wage. Businesses are not keen on this, otherwise they could voluntarily pay more. At the same time they pay low wages, they post profits. This is basically a choice we can make; should that money go to wages or profits. The thing is that wages, especially of poorer people, go straight into the economy as people buy stuff to improve their standard of living. While profits could theoretically go into the economy too, by being invested back in the business, in practise investment in the real economy has stagnated over the last 30 years and profits are more likely to go in to the financial markets. Therefore if businesses pay higher wages and post smaller profits, the economy will be better off (nef has done the analysis). And while you might worry about what spending on ‘stuff’ will do for the enviroment, if we bought leisure, or experiences, or services we can lighten our load on the environment (see Stuffocation, we can save the enviroment without needing the human race to suddenly become perfect). The final question was a few votes, leading up to whether we should build in the green belt. A poll of the attendees showed a huge majority in favour of rent controls. I’m even a bit reluctant to mention that because the idea has been so thoroughly demonised that I’m afraid people will write off the whole debate as [left wing slur]. But I’m going to go ahead (wait I already went ahead). Almost nobody was in favour of freeing up planning control, probably because only the developers would profit and we are sick of loosing our best buildings (Waitrose in Holloway, I’m looking at you). Finally a few more people were in favour of building in the green belt and that is the craziest part. 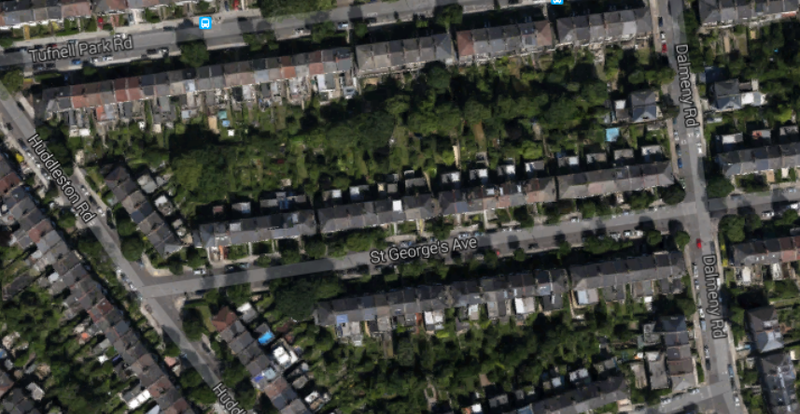 Why do we want to build in the middle of nowhere or zone 7, or wherever the green belt is, when we could build in zone 2, where the jobs are and the infrastructure already exists. 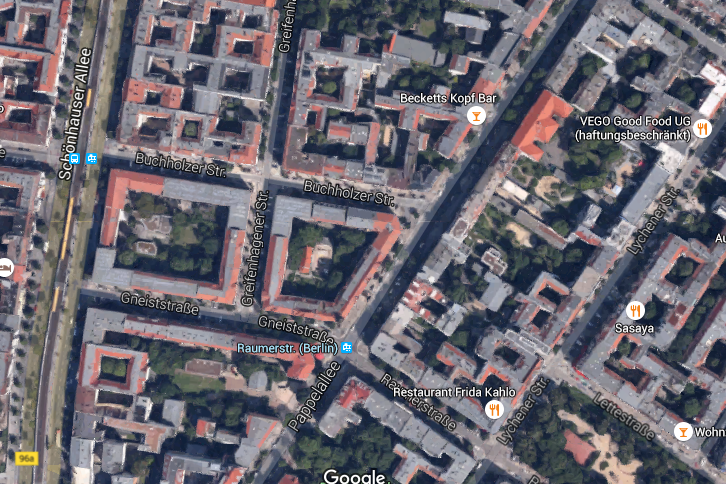 Compare these two screen shots of Islington and Prenzlauerberg in Berlin (where I lived, three stops from Alexanderplatz), a pretty good bit of Berlin that is gentrified because everyone wants to live there. And bear in mind most houses in Islington are three stories while every house in Berlin is five stories with handsome high ceilings all the way up. And interesting little shops and cafes everywhere, because they have the people to shop in them. I’m not saying there is an easy solution to this because I’m not sure building an extra house in the back of every garden will work and I don’t want to knock down handsome Victorian houses, and so many modern buildings are hideous, but, but, but, but, Zone 2 can fit more people in (Waitrose in Holloway, after knocking down a five storey building to build a two story one, I’m looking at you). So no to Greenbelt building, commuting never made anyone happier. Author christinedelonPosted on 21 September 2015 Categories Uncategorized1 Comment on Why do I feel like London is built by the renters for the investors? Was that something about how to beat the stock market? In my previous post I mentioned that one of the unpredictable things Pounstone’s book can predict is the stock market. As the whole thing runs on people (not numbers) that sounds quite doable. Poundstone doesn’t explain the first step, though Pete Comley does in his excellent book Monkey with a Pin. This book was inspired by the observation that 85% of fund managers don’t beat the market. Hence the value of index funds, which are the market. When I first found out what an index fund is a few years ago I naively thought it was a new invention that would devastate the city. If people can get the same or better results for less money why wouldn’t they? I guess if psychics can earn money, and if there are whole professions where the experts guess right less often than chance, the fund manager doesn’t have to worry. So Pete Comley pointed out the very important point that half of the ‘growth’ of the stock market is just inflation. Perhaps ‘just’ inflation is unfair. Inflation proofing an investment is pretty useful. Though Pete Comley showed that if you put cash in the highest interest account you could find, once a year, then over the last 20 years (not including current low rates) you would actually also beat inflation. So if you invest £17,250 and 23 years later you have £27,500, that looks like a respectable 4.2% per annum gain, but if inflation averaged 3.5% that was really only a 0.7% gain. Comley further calculated that overall per annum return on investment over the last century, after subtracting out inflation, is 5% and average investement costs are 6%, giving overall returns of minus 1%, which would look perfectly respectable after inflation, say, 4%. So beating inflation is not to be sneezed at. Actually since reading Monkey with a Pin I think Poundstone is the first person I’ve read who discusses the value of markets after adjusting for inflation. If fund managers are not beating the market and the market is going up anyway because of inflation, which you get for ‘free’ just by owning unmanaged shares, then the next step is to minimise costs. If you have an index fund of the market that is going up 5% a year with 0.5% annual fees (the maximum you should pay for an index fund, you might get a little less) and you compare it to a fund that is consistently beating that index (the market) by 1% a year, 6% overall, but which charges 2%, then I don’t even need to plot the graph to show you that lower fees are more important than small gains. I like graphs so I’m going to plot it anyway. 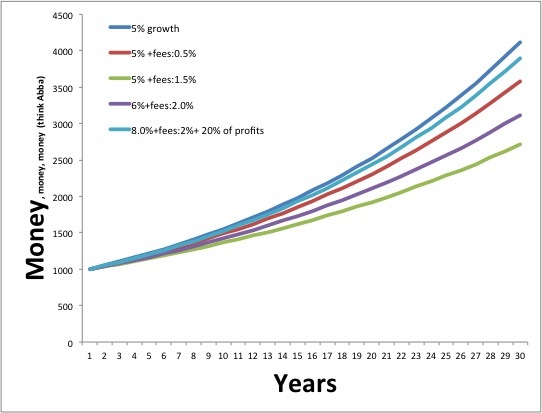 See how compounding interest doesn’t make much difference for the first 10 years and takes off after 20 years. But look at the huge difference when costs are 0.5% (red) vs costs of 1.5% (green). A mere extra 1% knocked almost a quarter off the final income. And while the expensive hedge fund at 2% interest and 20% of profits (purple) did beat the index fund, it would have to beat the market by 3% consistently for 30 years. Good luck finding a manager who is in the top 15% for 30 years running and who won’t retire in that time. There are a lot more to the costs that I didn’t discuss (if the market goes up by 5% and fees are 0.5% you get less than 4.5%)and I didn’t even get round to the superspecial unpatented Poundstone method to beat the index funds. That’ll have to be another post. Author christinedelonPosted on 10 September 2015 Categories books, UncategorizedLeave a comment on Was that something about how to beat the stock market? I just finished reading William Poundstone’s: How to predict the unpredictable. It turns out we are actually quite predicable. Each chapter covers one topic and finishes with tips on how to win at e.g. rock paper scissors, tennis and the stockmarket (check out the table of contents on amazon ‘look inside’). One point is that we really have no clue what random looks like, If you map 50 coin tosses as black and white squares, the random one (middle) looks fake and the fake one (top) looks random. In the random set, each coin toss has a 50/50 chance of being different from the previous one. In the one we think of as random, there is a 75% chance the next block will be different from the previous one. We have to go up to a 90% chance of a colour change (bottom, ) before we begin to think it looks fake. This is the law of small numbers. A pschological trick making us think the rules that govern large numbers (50/50 outcomes of 1000 coin tosses) will also govern small numbers (not really, there’s a pretty high chance of not getting a 50/50 split in 5, or 10, coin tosses). Next up is passwords and PIN numbers, with estimates that 11% of the population uses 1234! If you found a debit card, and tried the three most likely PINs (1111 at 6% and 0000 at 2%) you’d have a hair under a 1/5 chance of getting the right number. The tip for passwords is to find a random password generator, generate a few passwords and find one that is easy to make up a story to help you remember. Then only use it for a few important secure sites and not every time some online form asks you for a password. Personally I’m so sick of account names and numbers I’ll stop right there rather than sign up to another one. I’ve been reduced to buying theatre tickets by phone, which was actually just as easy. Poundstone did fall down on one aspect. He describes the Target campaign where they looked at the buying habits across 25 products and found they could tell when someone was pregnant almost to the week (the list included suddenly buying certain vitamins and scent free lotion). They would then send these women flyers for baby stuff and as long as they mixed it up with lawnmowers, so the women didn’t know they had been targeted specifically, they were happy to start the new phase of their life as a Target shopper. The story includes the angry father of a sixteen year old, who then found out she really was pregnant. Here Poundstone says the new predictions challenge not only privacy but also our illusion of free will. But I disagree, it is definitely a privacy issue. Target even agrees re adding the lawn mower ads ‘as long as the pregnant woman thinks she hasn’t been spied on‘. It’s an interesting grey area. It is not unreasonable for the shop to have records of your buying habits, but putting them together gives them data you don’t want them to have. Maybe the moral here is pay attention to an upcoming need for new laws, get rid of your reward cards, and pay cash rather than card. I’m reluctant to do the second, but then I never do spend the points, so I’m putting it on my to-do-when-I-get-round-to-it list. Though I did just sign up to the Paperchase reward card, I’m hoping there is a limit to what they can figure out from my stationery spending. The second requires planning and effort, but is something I aim to do more often than not (I’m also going to put a big sign on my back saying ‘suitable mugging target’). The first one is on the back burner. I’m hoping someone else will set up a campaign group and start lobbying MPs to ban shops scanning our faces, recording everything we do in them, saving that data and paying attention (via algorithms) to all the data. Finally, make sure you delete your cookies before shopping on line, you’ll probably get better prices. Ugh, why is living in the future so tedious.